As a hunter, we humans have long recognized that there are many delicious meats out there. From the tiny quail and rabbit to the medium sized goats, venison and beef cattle to giant bison and water buffalo. Just a few generations ago wild game was the largest part of the average American diet. We lost this vital connection to the land, as the move to city living meant relying on corporately owned factory farms. Domesticated and easily produced choices for meat selections quickly became limited to beef, pork and chicken. Fortunately, there is a renewed and growing interest in wild game birds and animals. Educated “locavores” and true gourmands alike are demanding more choices, especially in regions suited for raising delectable and indigenous game. For the past twenty-five years, Nicky Farms has been bringing this assortment of meats to fine dining restaurants and select markets in the Northwest. As a butcher and purveyor of specialty game and high quality meats, Nicky Farms strives to support local ranchers and growers while providing high quality, sustainable and locally raised meats. 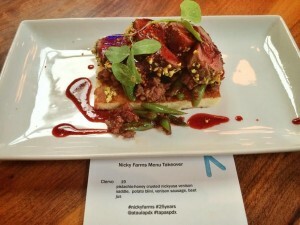 Bringing chefs and epicureans authentically American meats is Nicky Farms’s goal. 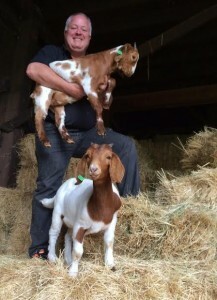 Rabbit, quail, fallow venison, Northwest elk, water buffalo, emu, bison and soon chicken are just some of the offerings Nicky Farms has coming from its own farm plus a group of family-owned, sustainable farms and ranches across the Northwest. On Nicky Farms’s own 36-acre farm in Aurora, Oregon and on the partner ranches and farms, the animals are born and butchered in one place. This results in not only the best humane practices, but the finest natural game birds and meats of exceptional flavor. The non-gamy flavor profile of these farm-raised specialty meats comes by allowing the animals to graze stress free and harvesting gently. Always being on the lookout for new taste temptations, Nicky is introducing a unique, wild and delicious product from the Hawaiian Islands: Wild Hawaiian Venison. Working with partners on the islands, Nicky is now able to supply Nui Venison. 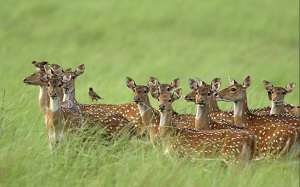 Axis deer, also known as chital deer or spotted deer. The Nui Venison comes from Axis Deer, which were introduced to the Hawaiian Islands in the late 1800’s by King Kamehameha V from India. Hawaii’s wild population is now more than 100,000 on Moloka’I, Lan’I and Maui. Unfortunately the deer, as a non-native species, are causing a host of ecological problems on the islands. Harvesting the wild deer not only provides a great source of game meat, but also helps protect native Hawaiian plants and wildlife from possible extinction. The largest of the tropical deer species, Axis Deer have evolved in Hawaii without the stresses of seasons, migrations and predators—the result being less than 1% intra-muscular fat and a subtle and full-flavored taste. Nicky Farms products are available from Eugene to Seattle at New Seasons Markets, Barbur World Foods, Zupans Markets, Fitts Seafood, Central Co-op, Don & Joe’s, Metropolitan Market, Olympia Local, Paris Grocery, Rainshadow Meats and more. Come get a taste of the wild with Nicky Farms at the Seattle Wine and Food Experience, Sunday February 21st. Chef John Sundstrom of Lark and Bitter/Raw along with Januik Winery’s Chef Seth Fernald and Sous Chef Jeff Zanatta will be dishing up Caribbean-inspired goat and wild Hawaiian venison.